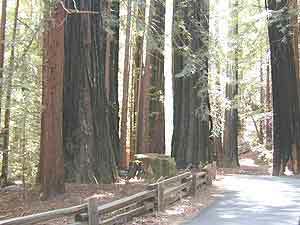 Located off California SR 9 Highway 9 northeast of the beach town of Santa Cruz this popular redwood park is a favorite among tourists and residents alike. 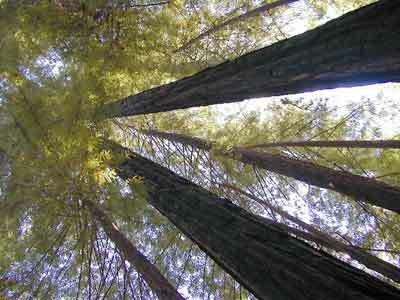 Since 1902, Big Basin Redwoods State Park is dignified as the oldest State Park in California. 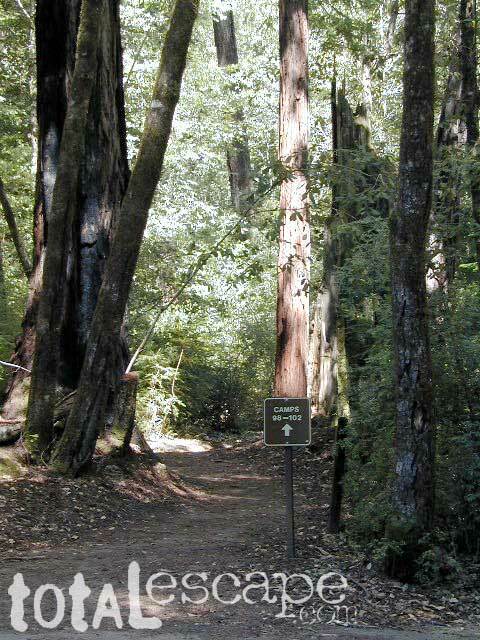 This is the home to the largest continuous stand of ancient coastal redwoods in Central California. The park consists of over 18,000 acres with mixed conifer, oaks, & chaparral. The climate ranges from foggy & damp near the ocean to sunny, warm ridge tops. Winter: Cold, overcast & rainy. Majority of its average 48 inches of rain December through March. Spring: Cool with showers & morning and evening fog. Average daytime highs 60's, lows in 30's to 40's. Fall: Warm day to cold nights. Occasional early storms. Average highs 75 to 60's, lows 50's to 30. 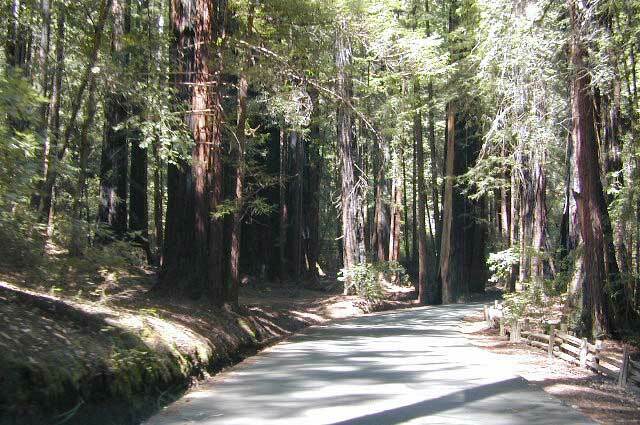 This dense forested park takes a while to reach, but is well worth the curvy road. A few culdesaq parking lots lead to walk in shady campsites despersed among the hillsides. Ferns, hiking trails & waterfalls surround these magnifgicant redwood trees. 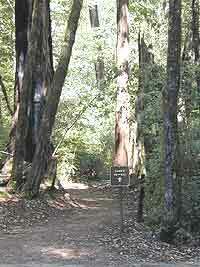 Elevations in the park vary from sea level to over 2,000 feet. The park has a surprising number of waterfalls, a wide variety of environments , many animals and lots of bird life. 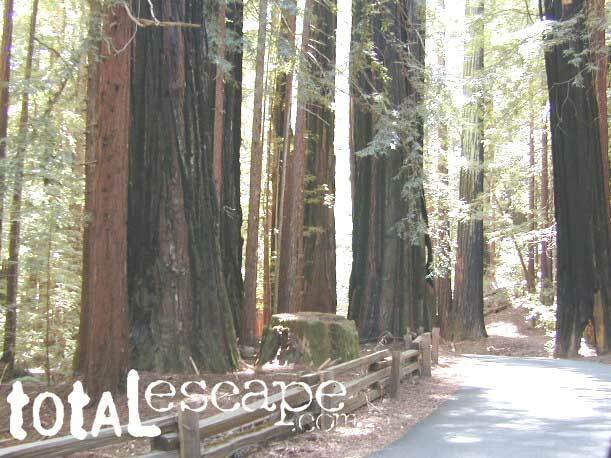 The park has over 80 miles of trails, which serves hikers & equestrians, links Big Basin to Castle Rock State Park and the eastern reach of the Santa Cruz range. The Skyline to the Sea Trail threads its way through the park along Waddell Creek to the ocean & a beach at a freshwater marsh adjacent called Theodore J. Hoover Natural Preserve. Backpacking trailcamps on the Skyline to the Sea Trail are reservable only by calling 831-338-8861 between the hours of 10am - 5pm. Dogs ARE NOT permitted on any of the trails. 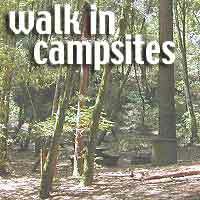 Dogs are permitted in the campsites, picnic areas, and on paved roads only. They must be on a leash and attended at all times.